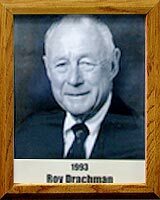 Roy P. Drachman spent a long and rewarding lifetime contributing to sports in Pima County, both on and off the field. The shortstop for the 1924 Arizona State Championship baseball team at Tucson High School attended the University of Arizona from which he received an honorary Doctor of Law Degree in 1985. A semi-pro baseball manager for 5-years (1927-31), Roy also played on the Southern Pacific “Rails” team in the late ’20s and early ’30s. He even spent some time in the late 20’s as official scorekeeper for the Tucson Cowboys of the Arizona-Texas League (Class C). In 1940, he became co-owner of the Cowboys. In 1946 Roy was largely responsible for convincing Bill Veeck and Horace Stoneham to move the Cleveland Indians’ and NY Giants’ spring training to Arizona. Roy organized and was president of the City Baseball League during World War II and helped keep baseball alive while the minor leagues were shut down for the duration. For five years, six local semi-pro and service teams played 6-nights a week. He was a former member of the Tucson City Baseball Commission and in the early ’30s, switched playing fields long enough to twice become City Golf Champion. He organized and was first president of the Tucson Conquistadores, which sponsors the Tucson Open to raise funds in support of youth sports, and Olympic athletes. A tireless and dedicated giver of both time and financial support, Roy was three-time president of the Towncats, helping to raise funds to support Arizona Wildcat football teams. Roy donated over $400,000 to finance the University of Arizona Track Stadium.